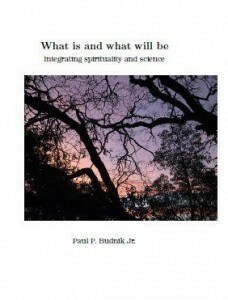 What is and what will be – Integrating spirituality and science – Paul P. Budnik Jr.k begins with the distinction between structure and essence. The former is the world of mathematics, science and technology and the latter is the domain of conscious experience. He explains how complete this split is in contemporary scientific understanding. Next he asks what it means to exist. This leads to a connection between scientific understanding and values and meaning. With this philosophical base Paul P. Budnik Jr. develops some mathematics and physics that is relevant to this connection. Some of the physics is speculative and labeled as such. The book then develops this connection, first in philosophical terms and then in more concrete and practical ways. The book ends with philosophical and spiritual speculation that aims to develop something approaching an objective spirituality.